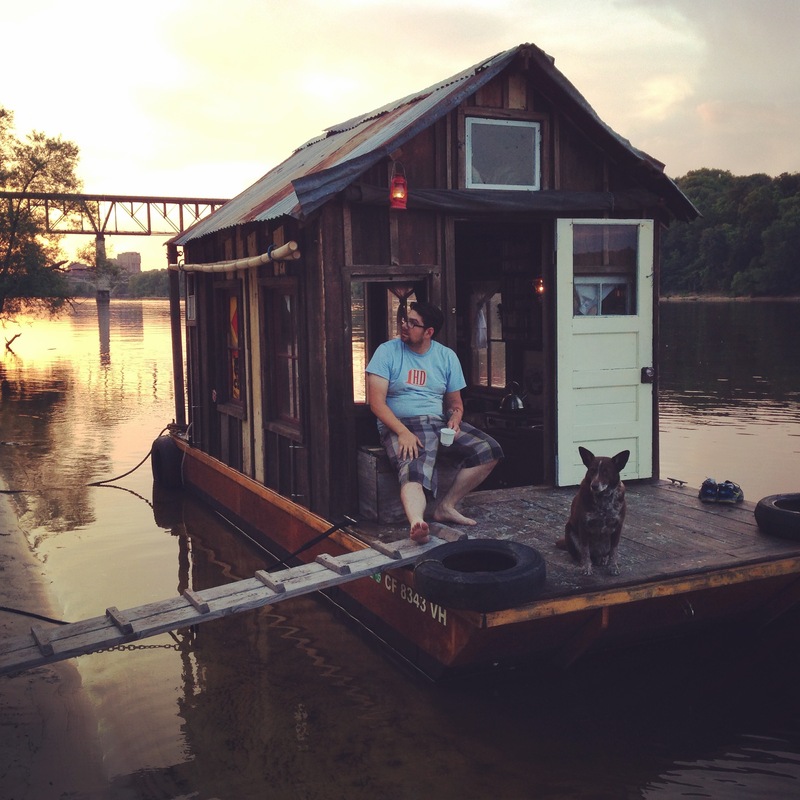 Local artists Wes Modes and Kail Dalgleish traveled the Mississippi in a converted chicken coop, echoing historial modes of travel on America’s greatest river. We’re all sharing our “How I Spent My Summer Vacation” anecdotes around the metaphorical water cooler this time of year. Long-time Santa Cruz artist and activist Wes Modes has his story too, though it might sound to many ears as if the summer vacation he’s talking about is the summer of 1881. Modes launched an ambitious oral-history project over the summer that he calls “The Secret History of American River People.” Modes and his “first mate” Kai Dalgleish (and his loyal dog Hazel) embarked for a month-long trip on the grand Mississippi River in a shantyboat much like people have done from the beginning of American settlement of the region. A century ago, such a shantyboat on the Mississippi would have been a common sight. Today, not so much. As we sat in the very same shantyboat, now dry-docked in Felton, Modes told me of a moment when he and his first mate decided to ride out a storm on a nearby beach. The shantyboat was 20 feet long, but the cabin only 10 feet, with room for two crew members, three if you count the dog Hazel. Modes was not only planning on having a grand old time in a Finn-esque river adventure, though he certainly did that. He was also interested in creating a tangible archive of contemporary Americans’ attitudes and relationships with the Mississippi. He is planning on creating a rich academic archive for future historians and researchers by cataloging up the 30 hours of interviews with dozens of people. He is also creating what he calls on ongoing web documentary with journal entries, photographs and video now on display at peoplesriverhistory.us. Finally, he wants to make the boat itself a resource for people interested in river culture. He plans to make it available as part of Radical Craft Night (no pun intended) at the Museum of Art & History in Santa Cruz in November. Modes and Dalgleish navigated the upper Mississippi, from Minneapolis to La Crosse, Wisconsin, which took them a little over the month. This part of the river is not the mighty, broad river of the popular imagination. By the time the Mississippi has reached southern Missouri, it has taken on the Ohio, Missouri and Illinois rivers. In Minnesota, the river is of different character. Modes had had quite a bit of experience in similar river trips. He traveled by raft from Omaha to Kansas City on the Missouri River. “I did that trip to understand the historical context of that river and I discovered that people had abandoned the river. He later traveled several rivers in the West, such as the Sacramento and the Willamette. The month-long sojourn on the upper Mississippi is merely the first part in an ongoing project to explore river culture in the U.S.
Before the Mississippi trip, he found that people living along the great rivers of America were largely disconnected to them. He found many people in Eugene, Oregon, for example, who didn’t know that the Willamette river flowed north toward Portland. “My experience was all these rivers were neglected,” he said. Of course, in the first century of American history and many decades after, the nation’s large rivers were the main thoroughfare for large-scale transportation and settlement was almost always built with a mind toward river access. The river was the way that people, goods, even services were moved from town to town. Then came the railroads, and later the highways, changing everything. The rivers became incidental to people’s lives. Modes interviewed scientists, fishermen, boaters, artists and many regular people living along the river. He explored the rich culture of boathouses on the Mississippi – he pointed out that a “houseboat” was a boat you lived on, while a “boathouse” was a permanent, immobile house that happened to float on the river. Modes plans to continue the project with more field work and more exploring the river in the way that thousands have explored it over the course of the last 200 years. The Mississippi has been engineered and altered to the point that it’s a different river than it was in the 19th century. But river culture is far from dead. For a blog, photos and videos of “The Secret History of American River People,” go to peoplesriverhistory.us. ← Small and Not So Small Town Press [Updated] ← Reddit: I am an artist spending the summer in a shantyboat on the Mississippi River gathering stories of river people. AMA!